Because this book contains life-saving information, Dr. Aardsma has chosen to make it available as a free download. This ensures that anyone with Internet access, anywhere in the world, regardless of economic ability, can have access to the life-saving information it contains. A paperback copy of this book may be obtained through a gift to The Biblical Chronologist. Click on the "Give a Gift" icon in the banner above for more details. 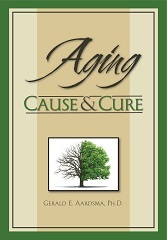 Author: Gerald E. Aardsma, Ph.D.
Subject Area: Human aging; Biblical life span data. Description: In this revolutionary book, the culmination of decades of research, Gerald Aardsma solves the mystery of aging using ancient life span data from the Bible.